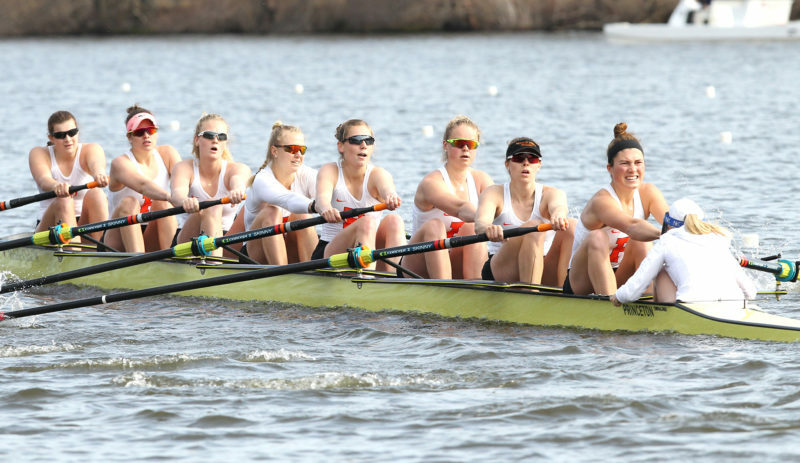 As Lori Dauphiny assesses her Princeton University women’s open crew team this spring, she believes the program’s Class of 2019 is poised to go out in a blaze of glory. With stars Claire Collins and Emily Kallfelz setting the tone, the team’s senior group brings a lot to the table. “It is a very strong senior class. Claire and Emily are our co-captains; they also went to U23 and have done well,” said Dauphiny. Dauphiny hopes that class strongly influences the program’s freshman group. The varsity eight seized opportunity in the opening regatta of the season on March 30 as it defeated Brown and Ohio State to retain the Class of 1987 Trophy. Princeton’s top boat covered the 2,000-meter course in a time of 6:15.8 with Brown coming in second at 6:19.3 and Ohio State taking third in 6:19.5. The Tigers had some great competition last Sunday as they hosted the Ivy League Invitational on Lake Carnegie. Two wins from Princeton’s top boat were among highlights of a long day for the Tigers. In the morning session, Princeton retained the Class of 1984 Plaque by defeating Harvard-Radcliffe, Penn and Dartmouth. Later, the Tigers earned the Class of 1975 Cup, besting Harvard and Cornell. The second varsity eight made big strides, placing second to Harvard-Radcliffe in the morning and then edging the Crimson in their second meeting of the competition. “The 2V turned around from first race to second race; it was an internal change in that boat that was helpful,” said Dauphiny, whose boats went 21-1 on the day. Dauphiny knows her boats have to keep getting better as they face some formidable foes down the stretch of the regular season. “We have some big races coming up,” said Dauphiny, whose team hosts Yale and Texas on April 13 in the competition for the Eisenberg Cup with Wisconsin, Rutgers, Columbia, and Syracuse on the horizon in upcoming regattas.